When you think of climate change and what it’s doing to the wildlife, you most likely think of the melting ice caps and polar bears or the diminishing rainforests. While these are troubled areas, many other habitats and the plants and critters that live within them are also being affected around the world. One example of climate change that doesn’t get as much attention as it deserves occurs in the deserts. These locations are also facing a record rise in temperatures, and the plants and other species that live there are slowly crumbling under the heat and could ultimately disappear for good. 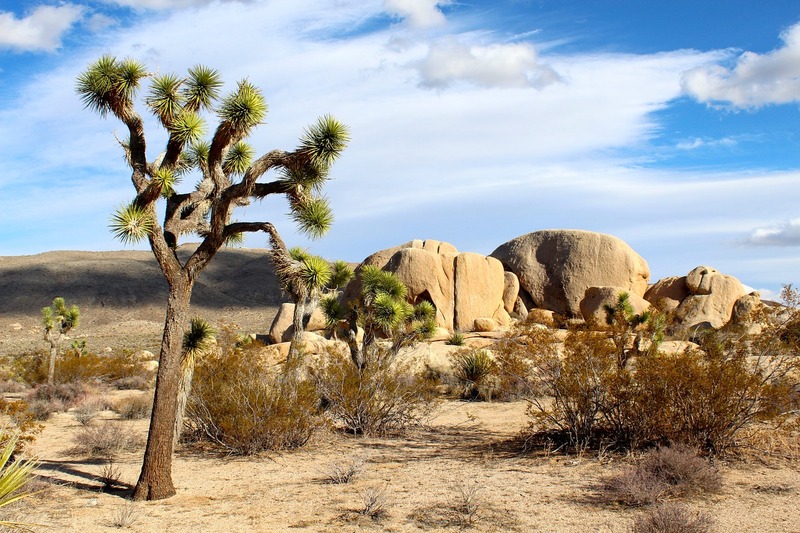 Here, Ranger Mac will take a closer look at a specific desert park and the trees that give it its name: Joshua Tree National Park in southern California. The Joshua tree is a member of a family of plants that are part of the agave family. This type of tree is found in the areas that stretch across the Mojave Desert in California and into Nevada, as well in areas of Utah and Arizona. Due to the changing climates in our desert regions, the Joshua tree is one of four species that the Fish and Wildlife Service is now considering for a listing on the endangered species list. The desert area of Joshua Tree National Park is a harsh and unforgiving climate but is home to a surprisingly diverse range of species. Since weather changes a lot from year to year, most species are able to adapt to regularly changing climates. But as the Earth continues to warm and our southwestern states head into hotter than normal times, it’s creating harsher temperatures, droughts, and more frequent wildfires. This change in conditions to the more extreme will have an effect on the populations of species, including the Joshua tree itself. In fact, the changes have already started to have noticeable detrimental effects. The Joshua tree has adapted over time to only need around one to two good rainstorms a year to survive in the otherwise dry climate of the desert. But with the area becoming warmer than usual at such a fast pace, there’s no time for the Joshua tree to adapt to the new norm. Rainfall is critical to the health and reproduction of these trees, as well as all other species in the area. With this climate becoming drier and warmer, these species will shift into the higher elevations of the park to seek out the coolness and moisture they need to survive. This will ultimately change the entire landscape that is Joshua Tree National Park and reduce the amount of land available to all of the competing species. With the changing climate happening at such a fast pace, park scientists are conducting research to learn more about which of these species will be most vulnerable to climate change and how they will be affected. This will help the National Park Service know what to do to start the process of preserving the species that are most affected. The good news is that even though there has already been some loss of trees in the National Park, it does not seem to be an unmanageable problem so far. Joshua trees growing at lower elevations in the park are not reproducing as quickly, but there are some seedlings found throughout the area. The questions now are - how do the park service and its scientists go about containing this issue, and what can be done to correct the situation so the Joshua tree stays off the endangered species list? Driving hybrid and electric vehicles inside the park. Harnessing energy from solar panels for use at park operations. Installing energy-efficient lighting and solar motion sensor lights. Installing high efficiency heating, ventilation, and air conditioning units in park buildings. Established a 'no-idling' vehicle policy for cars inside the park. Recycling and reducing waste inside the park. While all of these things are small steps to combat the bigger problems, it’s a step in the right direction, and we can all do our part to help save these parks and the species living there. With these policies being established inside the park, it’s time to look into what we can do to help outside the parks in our own communities as well. Reduce the amount of air conditioning you use in the summer and the amount of heat you use in the winter. Replace old appliances with Energy Star-compliant ones. Turn off the lights when you leave a room and install energy efficient bulbs in your home. For more detailed information, you can also check out Ranger Mac’s blogs that go over energy conservation, water conservation, soil conservation, and wildlife conservation. While these are just a few ideas to get you started, there are many other small changes you can make to your everyday life that will have a lasting impact over time and help keep our Earth in a sustainable, beautiful condition.